Q:But Microparks take up parking spaces! A:Currently Megabuses and Bolt buses are taking up our neighborhood parking spaces. Would you rather have a Megabus parked on your block or a neighbor parked on your block? 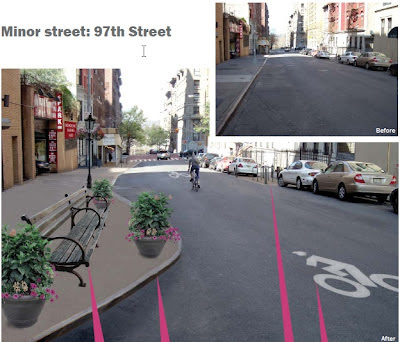 bike parking, seating, public art, gardens, plantings, or trees, alone or in combination. "The outdoor space was a hit from the beginning. The timelapse video below shows a "day in the life" of Local. 96 people enjoy the special seating in the space of a few hours, space usually taken up by two parked cars. While I was at Local, a customer asked if they were going to install the platform again this year. The answer is yes- Liz and Craig plan on having it installed in April; it will remain in place until at least October. 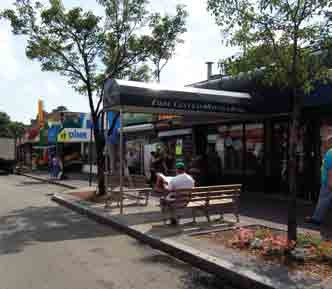 Curbside public seating platforms offer well-designed seasonal, outdoor public open spaces and seating at places where sidewalk seating is not available. During warm-weather months, when the demand to spend time outdoors increases, curbside seating platforms may temporarily replace a few parking spots with neighborhood gathering places perfect for eating, reading, working, meeting a friend, or taking a rest. They also help beautify the streetscape with attractive landscaping.